Recently, I learned that certain smartphones contain an actual pressure transducer. 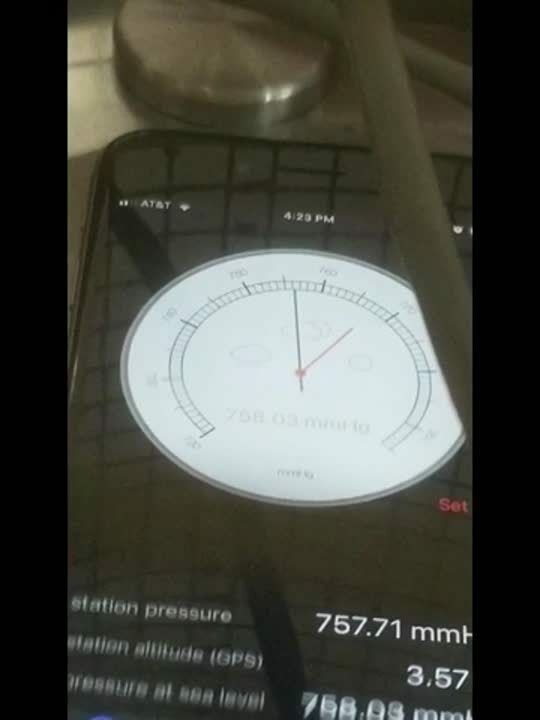 I shared this info with a friend who insisted that the phone was not really measuring pressure, but was instead using the internet to download the pressure based on the phone’s location. Now, I had to prove them wrong. So, I did what I thought was the obvious proof… I placed my phone in a small test chamber (i.e. 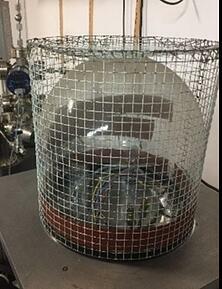 a bell jar as shown in the photo below), and then pumped the system down to show that the readings were, in fact, generated locally. I captured this all on video - see below. Note: It was hard to get a good image of the phone inside because of the protective cage surrounding the glass bell jar. Now, you may be wondering why a smartphone would include a vacuum/pressure transducer. In addition to using the changing barometric pressure as an indication of weather, the pressure transducer readings can be used to provide the user’s altitude when hiking, cycling, or climbing. The formula to convert pressure to altitude at low altitudes is fairly linear. So, it is true that you may be able to use your smartphone to measure vacuum in your system. However, we would like to suggest an easier way… check out our new HVG-2020A (“2020 Vision”) vacuum gauge. This gauge measures from just above atmospheric pressure (1000 Torr) to below 1 Torr with an accuracy of ±(0.1% of Reading + 0.5 Torr). The gauge features an optional color touchscreen display which has several different modes including pressure vs. time. It provides analog output (0-5 VDC, 0-10 VDC, 4-20 mA,…) as well as digital output (RS232, RS485, USB) and with our FREE Windows™ software, it is super easy to collect and store data. For more information about any of our vacuum gauges or our complete line of mass flow meters and controllers, we are here to help. You can contact us at hastings_instruments@teledyne.com or call 757-723-6531 (800-950-2468) or click the button below.